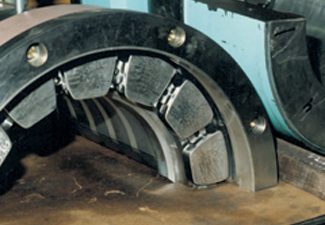 Our tilting pad bearings have been the industry standard for more than a century. Kingsbury's line of tilting pad bearings has been the industry standard for more than a century, starting with the first bearing designed and manufactured by Dr. Albert Kingsbury. 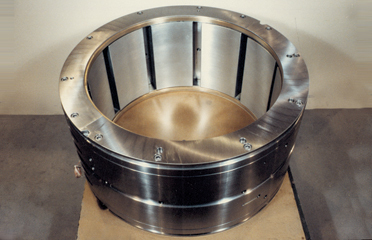 Kingsbury can supply not only thrust and guide bearings, but the thrust blocks, cooling systems and housings as well. 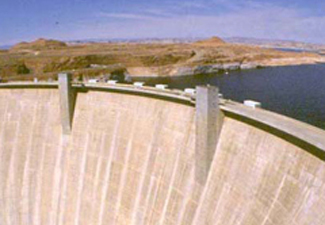 Hydro-turbine bearing applications typically have relatively low operating speeds and high thrust loads. Depending on the requirements, the thrust bearings may be equalized or non-equalized, and the guide bearings may be fixed geometry or have tilting pads. To date, bearings have been installed on hydro turbines and generators with shaft diameters varying between 150 and 1500 mm. In addition to supplying bearings for new applications, Kingsbury regularly furnishes retrofits for aging spring plate bearings offering complete diagnostic services as well as the replacement or upgrade of other makes of hydrodynamic bearings. 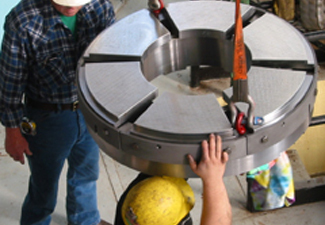 Our experienced field service engineers can travel directly to your site to help with dismantling and evaluating larger bearings that are impractical to ship to our factory. 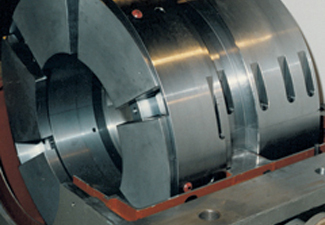 For Hydro Turbine Bearings Repair, Retrofit, or Replacement, visit the Bearing Services page. 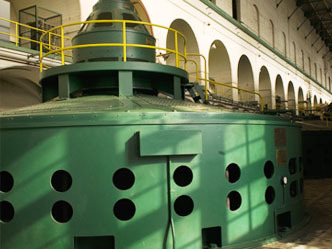 Albert Kingsbury invented and installed the original tilting-pad thrust bearing for hydro-electric turbine-generator applications in 1912. 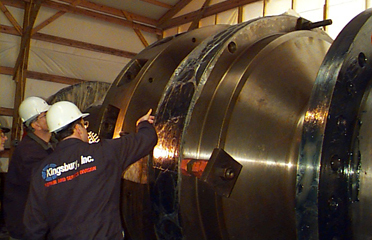 Today, Kingsbury remains the global leader in hydro-electric bearing supply, support, and refurbishment. Kingsbury provides insulated bearings and can convert existing, non-insulated designs into fully insulated bearings to reduce the risk of damage and down-time from stray shaft currents. Both traditional vertical and horizontal in-line, or pedestal-mounted bearing designs, are available. Expert field installation, shaft alignment, and technical field support are available from Kingsbury. 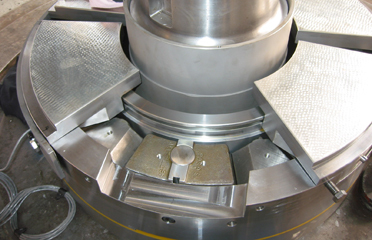 Kingsbury equalizing vertical thrust bearing replacement of an aging, non-equalizing OEM design. Mechanical leveling plate and pin-style equalization is available. For maximum load equalization and performance, Kingsbury's hydraulically-equalized thrust bearings completely eliminate friction and wear in the support components. 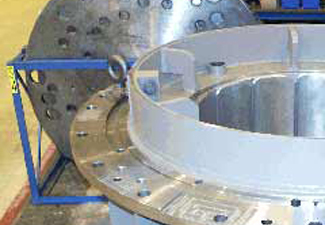 Kingsbury can repair or replace large solid or split thrust runners and thrust blocks up to 144" diameter. Horizontal Hydro retrofit for Roberts Tunnel Hydro Station (City of Denver) - Kingsbury specializes in replacing aging designs with more robust, higher load-capacity bearings with superior load capacity and simpler maintainability. Original, non-equalizing competitor bearing for Roberts Tunnel Hydro clearly showing wear and probable misalignment damage. Damaged spring-plate type OEM bearing and replacement Kingsbury "VK" style vertical tilting pad bearing. 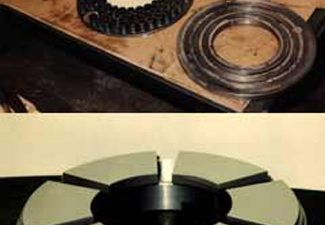 The "VK" design provides drop-in replacement options for customers with spring-plate, spring-shoe, and other inferior vertical bearing arrangements for hydro and other large motor applications. 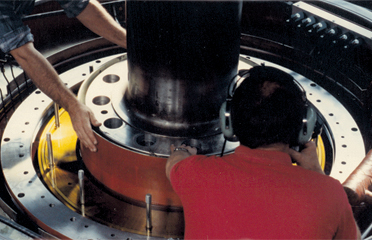 Field Installation of Vertical Equalizing Kingsbury "KBV" bearing assembly. 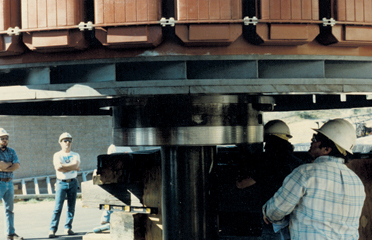 Field inspection supported by Kingsbury of thrust runner on an umbrella-style unit. Kingsbury has vast experience with solid and split thrust runners, steel and older cast-iron, upper and lower guide bearings, and thrust blocks. 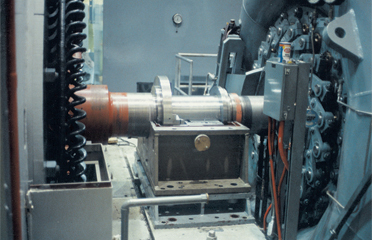 Retrofit Turbine Guide bearing. Kingsbury designs, manufactures, repairs, and retrofits upper and lower guide bearings and other large journal bearing applications for all makes and models. 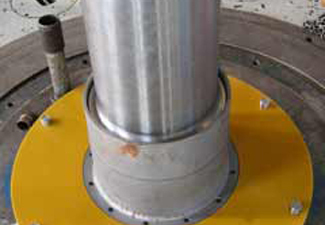 Large Vertical Turbine Guide Bearing ready for removal of old babbitt and rebabbitting.